1 tree planted in memory of Samuel Anderson Powers, Sr. Celebrating the life of Samuel Anderson Powers, Sr.
Be the first to share your favorite memory, photo or story of Samuel. This memorial page is dedicated for family, friends and future generations to celebrate the life of their loved one. 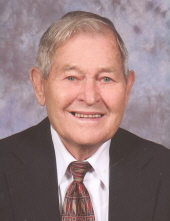 Obituary for Samuel Anderson Powers, Sr.
Samuel Anderson Powers Sr., 96, passed away Wednesday, March 27, 2019 at Fellowship Home of Cordelia Manor in Cordele. He was preceded in death by his precious wife of 71 years, Marjorie Mitchell Powers in 2014. Also preceding him in death included a sister, Helen Powers Herndon and two brothers, Jack Powers and Harold Powers. Funeral services will be held at 3:00 p.m. Saturday, March 30, 2019 in the chapel of Rainey Family Funeral Services with the committal service following in Evergreen Memorial Gardens. The family will receive friends prior to the service beginning at 1:00 p.m. at the funeral home. Sam was a devoted husband, loving father, grandfather and great-grandfather, businessman, and World War II veteran. He was known for his respect to others and that his word was his bond. Sam was born in Dooly County to the late Felton Margaret Fraser Powers and Noah Alexander Powers. He grew up on a farm in Dooly County and graduated from Dooly High School in 1940. After high school, he worked in the grocery department at the Atlantic and Pacific Tea Company (better known as A&P) in Vienna. In February, 1943 Sam enlisted in the Army joining the 515th Parachute Infantry Regiment. During this time he married his high school sweetheart, Marjorie Mitchell, on June 7, 1943. They built a home in Richwood and raised their three sons. In January of 1945, Sam left the United States headed to France to serve his country in WWII. After returning home from the war, Sam was honorably discharged from the service. He returned to work at the A&P grocery stores in Vienna and Cordele. Because of his strong work ethic and customer loyalty, he left A&P to work for the Cordele Cigar and Candy Company where he excelled and later becoming a business partner. Sam had a strong desire to own his own business and return to his grocery store roots. In the early 1960s, Sam opened Powers Thrifty Foods in Cordele. As owner of Powers Thrifty Foods, he was well loved by his many loyal customers. Many a hungry family was fed by Sam Powers’ generosity during his years of owning this store. He was known by many names: Sam, Daddy, Daddy Sam, Mr. Sam, Mr. Powers, or Sam Powers. He treasured each of these names and the people who called him those names. In 1999, Sam and Marjorie moved to Cordele to begin their retirement years. Sam is survived by his three sons and their wives, Sam and Jana Powers of Cordele, Gary and Margaret Powers of Lilburn and Randy and Donna Powers of Santa Rosa Beach FL; six grandchildren, JoAnna and Bob Arnold of Americus, Amy and Charles Hardin of Arabi, Mitch and Alanna Powers of Burbank, CA, Meredith and Matt Rhodes of Kathleen, Priscilla Powers of Cartersville, Randy, Jr. and Marilyn Powers of Portland, OR; and 11 great-grandchildren, Elise Robinson, Dallas and Ella Arnold, Billy and Celia Hardin, Brady and Hannah Powers, Scott and Reed Rhodes and Paige and Vivian Powers. He is also survived by three brothers, Marvin and Shirley Powers of Cordele, and Doyle and Lullene Powers and Edward Powers, all of Macon. The family may be contacted at the residence of Sam, Jr. and Jana Powers at 1007 East 22nd Avenue, Cordele, GA 31015. Memorial gifts to Cordele First United Methodist Church, P.O. Box 871, Cordele, GA 31010 would be appreciated by the family. To plant a tree in memory of Samuel Anderson Powers, Sr., please visit our Tribute Store. "Email Address" would like to share the life celebration of Samuel Anderson Powers, Sr.. Click on the "link" to go to share a favorite memory or leave a condolence message for the family.